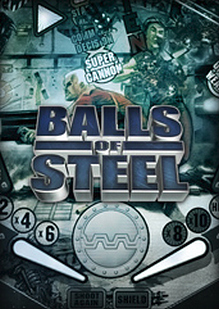 Balls of Steel (Pinball on Steroids) was removed from sale on Steam and GOG.com on December 31st, 2015. “You’ll flip out over the coolest, fastest, most innovative quicksilver ball-basher in the known universe! Across five savage, fully-animated tables, from the ricochet riot of Firestorm to the intense overload of Duke Nukem, Balls of Steel delivers all the authentic gravitational pyrotechnics of real pinball. View all the tables at once or get close for some whiplash scrolling action! Go gonzo with the 5 ball multi-ball mayhem! Squash scampering aliens to bloody oblivion! Hit rails, flippers, pops, sinkholes, targets, magnetic flippers, ramps, the ‘cyclotron’ ball accelerator — every conceivable pinball feature in all its glory! Its authentic pinball action — whiplash fast and finger-burning good! And hey, if it’s good enough for Duke… then it’s good for you! Splatter scattering aliens to bloody oblivion! Every table has unique missions and scoring secrets! Ramps, rails, flippers, pops–every table feature is rendered in full 3d!